The accounting industry has seen rapid growth and change in the last five years. The message to accountants is clear: client advisory services are the focus. With artificial intelligence and data automation on the rise, we know that the broad range of financial management services, those requiring human analysis, are the least likely to be commoditized (or automated). LivePlan is proud to be a part of the accounting industry during this time of rapid change. Our expertise is bringing strategic planning to all entrepreneurs. Our mission is to help people succeed in business. We have much in common with accountants, who also want to help people succeed in business, and who need to incorporate more strategic services into their businesses in order to differentiate. But we don’t want to just join the throng telling you that you should build your Strategic Advising practice. We’re committed to providing both the tools and training you need to deliver scalable, profitable advising services with confidence. We listen carefully and work closely with accountants and other software providers in the industry. We heard you when you gave us feedback on the features and updates you needed from LivePlan to build your advisory offering. We are pleased to announce six new major LivePlan software power-user features, built specifically for strategic advisors. These new features are big and exciting, and are just the beginning in supporting your efforts to bring strategic value to your small business clients. We heard you! You need a menu-based reporting package for the key metrics your clients need to see on a regular basis. You need to see data by QBO Class. You need to be able to select the financial metrics that matter to each client, and you need the charts to be simple enough that your clients will easily understand. You also told us you would love to have the deliverable package you share with clients visually represent your own firm’s brand. 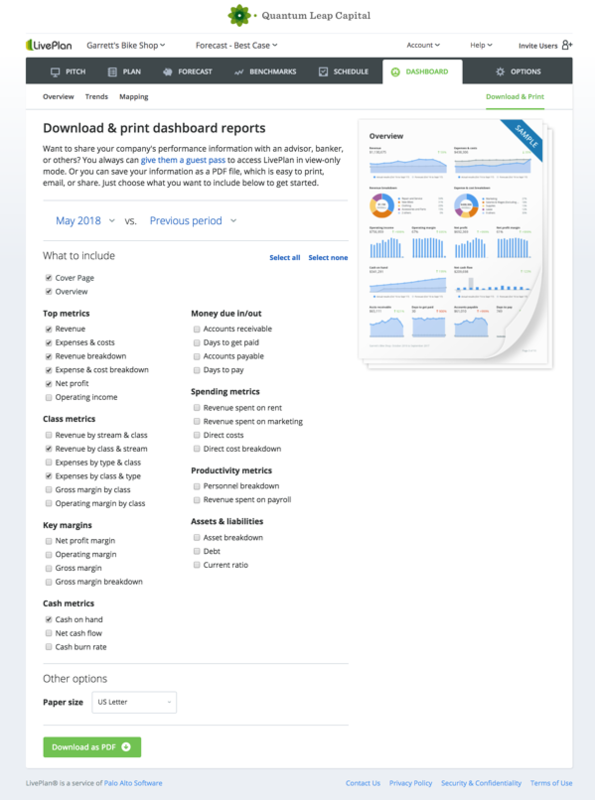 From the LivePlan Dashboard, select the charts you want, per client, and produce a reporting package PDF to email to your client on your own schedule. Add your firm’s name and logo if you wish. Your client’s data lives in QBO or Xero. You told us you'd love a quick LivePlan setup, without the hassle of manually mapping data-points or creating initial forecasts by hand. 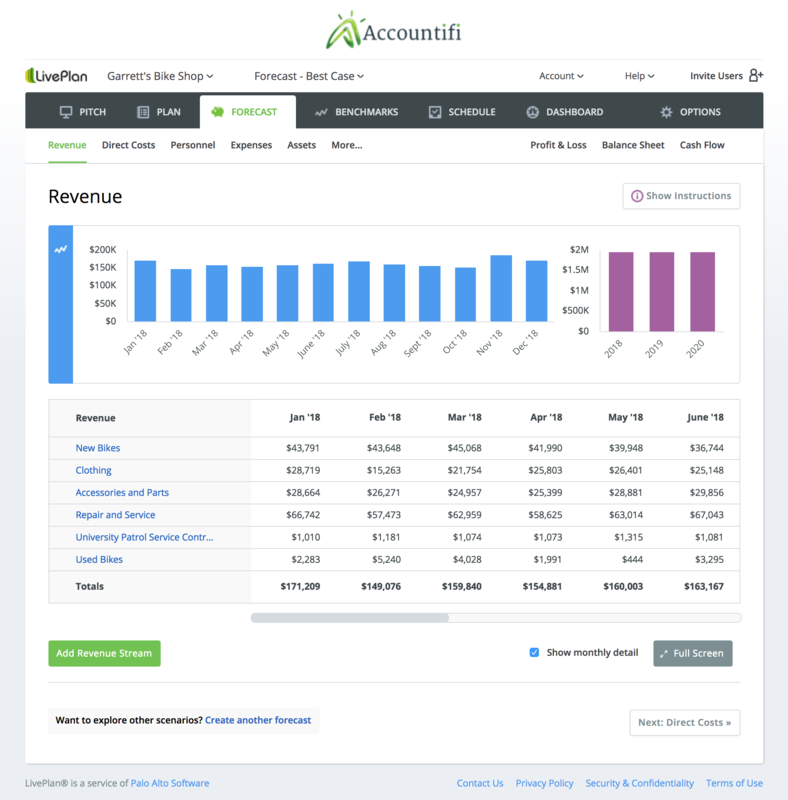 In under 90 seconds, LivePlan will connect to your accounting solution, pull in up to three years of historical data, populate the Dashboard and Benchmarks tab, and prepare a baseline forecast. All you have to do is tailor the forecast to your client’s growth projections. If you follow the LivePlan Method for advisory services, these features reduce your set up time by over two hours. You told us you would love to have your firm’s business name and logo appear on-screen and in reports. You bring tremendous value-add to LivePlan’s strategic planning solution, providing an insight to the data that a small business cannot do on their own, and your firm should be represented. Add your logo to appear at the top of each LivePlan screen (in-app), as well as to the cover page of the reporting package. We know you bring an immense amount of value to your clients, providing insight, advice, and the human element which cannot be automated. 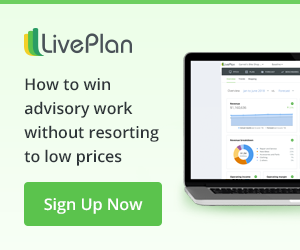 We want LivePlan to support your advisory business. These new features enhance LivePlan’s robust strategic planning tools for advisory services, like on-the-fly cash flow modeling, financial scenarios, and our dynamic Lean Planning module (the Pitch). Together, these make LivePlan an even more powerful solution for accountants. If you’re building the strategic advising arm of your firm, know that these improvements are structured to support the LivePlan Method, our business process for delivering strategic advising. The LivePlan Method is designed to let you be flexible, based on your clients’ needs, but keep a strict scope of work so your advisory services are scalable and profitable. LivePlan will always be focused on helping small businesses succeed, and strategic planning is at the core of that. We look forward to implementing even more feature sets that will help accountants and other financial managers advise small businesses.